"Tim Burton's Corpse Bride" returns the director to his roots in the giddy macabre, and what an entertaining homecoming it is. Using old-fashioned stop-motion animation (which Burton has improved upon since his first foray in "The Nightmare Before Christmas") to create atmospheric scenes populated by hoity Victorian caricatures and oddball creatures from a wonderfully weird underworld, the movie spins a fairytale fable of shy, awkward young Victor (voiced by Johnny Depp) whose arranged marriage to shy, pretty young Victoria (Emily Watson) is derailed when he accidentally gets hitched to a curvy, wide-eyed -- and decaying -- corpse (Helena Bonham Carter). Although he's fallen in love with Victoria on first sight the night before they're to be wed, Victor is nervous about being thrust into 'til-death-do-us-part by his social-climbing nouveau riche parents and her family of snobbish but flat-broke aristocrats. Nervously practicing his vows in the creaking, snow-frosted forest on the outskirts of his gray industrial village (after fleeing the rehearsal ceremony), Victor slips Victoria's ring onto what looks like a naked branch sticking up from the frozen ground. But it isn't a branch at all. It's the withered hand of a recently murdered young bride, who rises from her makeshift grave to say "I do," complicating poor Victor's life to a twisted and amusing degree. The titular girly-ghoul has cold blue skin that no longer covers her whole bodacious body, or even her whole face -- a fact that Burton and co-director Mike Johnson (from TV's claymation comedy "The PJs") use to spooky effect when needed. Yet her innocent, milk-saucer eyes make her strangely beautiful -- even if one of them is popped out from time by a friendly maggot who sounds like Peter Lorre. 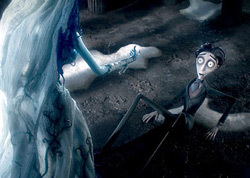 So much of the corpse bride's heartbroken soul comes out in the film's stupendous animation that there's more personality in her body language and her pained, curious, expressive face than in the voice Bonham Carter provides. Every one of the film's vivid characters has equally physicalized personality traits, be it Victor's downcast eyes and spindly, stick-figure frame, the severe local bishop's extra-tall miter and extra-long chin and nose, or the exaggerated features and comical pomposity of Victoria's rotund father (Albert Finney) and vampirical mother (Joanna Lumley). Many of them seem inspired by Terry Gilliam's cartoons from his "Monty Python" days. Full of light-hearted dark comedy and harmless, Halloween-y, PG-rated putrefaction, "Corpse Bride" follows Victor into a simple but spectacularly realized Hades -- full of singing-dancing skeletons and friendly severed heads -- where the confused, lovesick corpse bride has a hard time coming to terms with Victor's desire to return to his mortal love. Meanwhile, in the world of the living, a sinister dandy (deliciously voiced by Richard E. Grant) with striped pants and a bulbous, buttock-shaped lantern chin has designs on Victoria, which suits her stuffy folks just fine. Blessed with memorably iconic characters and a creative, if fairly predictable, plot loosely based on a Ukrainian folktale, "Corpse Bride" is quick (75 minutes), droll, and destined to be a perennial Halloween favorite. The picture's only weak point is a handful of fun but forgettable musical numbers by Danny Elfman, Burton's most favored composer of histrionic movie scores.